The rally has continued largely unabated since last update, and several markets have reached their target zones. As yet there's no concrete sign of a turn, but two markets have reached near-term targets, and one has reached a long-term target, and this suggests a cautious stance is warranted. 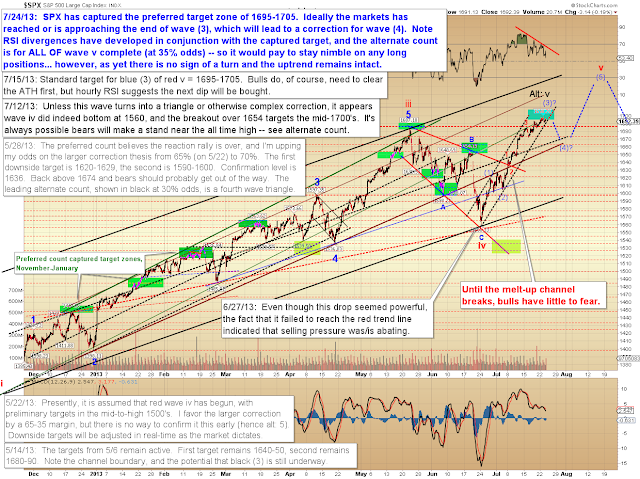 The S&P 500 (SPX) reached the 1695-1705 target zone for blue wave (3), but it's unclear if it has farther to run or not. So far, the melt-up channel remains intact. 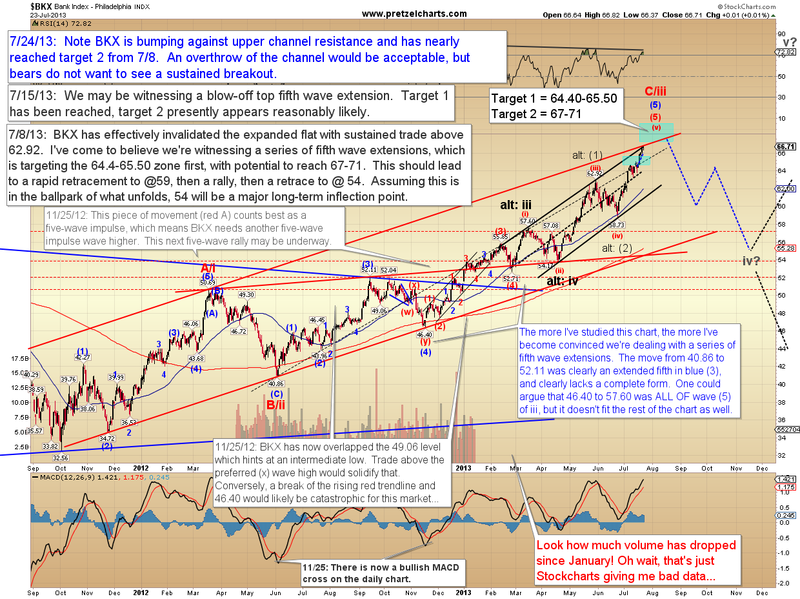 The Philadelphia Bank Index (BKX) cleared target zone one and is within pennies of the second target. It's now bumping its head against theoretical channel resistance, which is always a zone where I consider action in the form of taking profits and/or anticipating/positioning for a reversal. This is a zone that provides information and defines clear lines of demarcation. 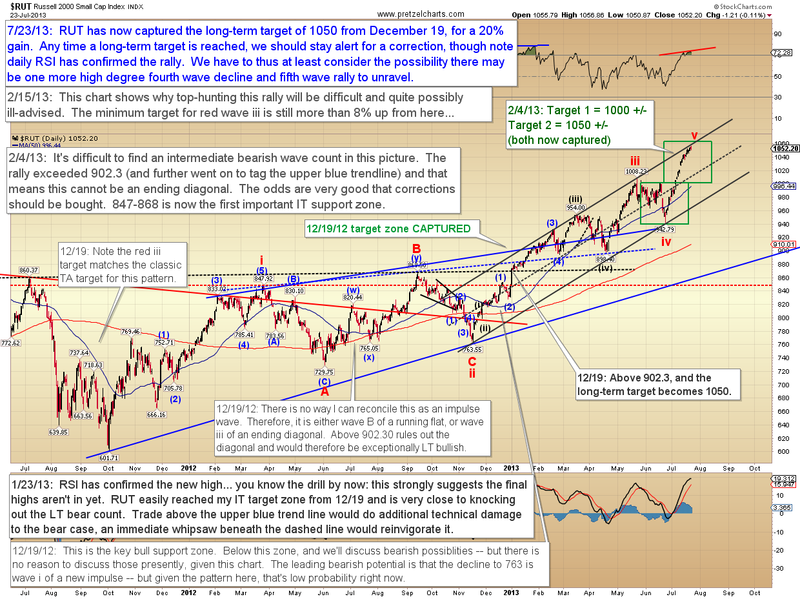 Of some note, the Russell 2000 (RUT) has reached the long-standing target of 1050, from way back in December. Again, it's unclear if there's farther to run -- but this market is also bumping into theoretical channel resistance, in conjunction with reaching my long-term target. In conclusion, there's yet been no real signs of a reversal, but with several markets reaching targets and resistance levels, this is clearly an area where we should begin watching for one. 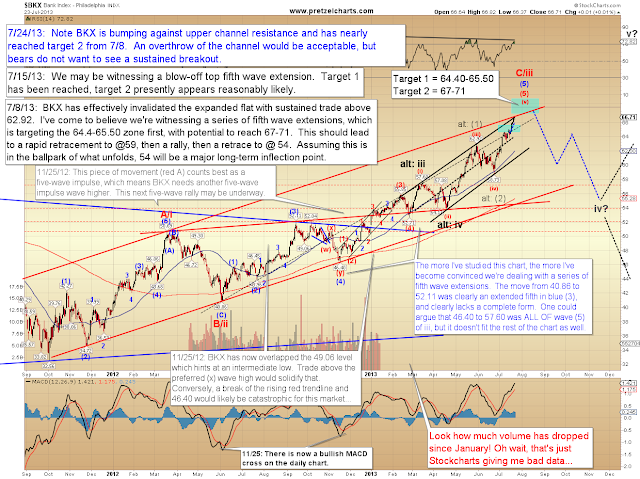 Presently, it appears the market still has a fourth wave decline to unravel, followed by a fifth wave to new highs. The alternate count allows the possibility that the market is completing fifth waves at multiple degrees, but we'll need to see the form of any forthcoming decline before adding credence to that possibility. Trade safe.